The above explosion has serious consequences for business professionals - especially for entrepreneurs. For example, in order to introduce a new product, powerful retailers often require companies to pay slotting allowances, which are fees paid solely to place the new product on the shelf. Furthermore, a proliferation of new products in the shelf make choices harder for consumers. In the light of these challenges, savvy marketers must understand which new products are most likely to survive in a retailer’s shelf, and what market share to expect, before they are introduced. In other words, you must determine what consumers' ideal new product is, and how well it will do on the shelves, before introducing it! Conjoint analysis is a useful tool to this end, and has helped firms of all sizes design new products and services - most famously the Courtyard by Marriott hotel chain. Specifically, using conjoint analysis, the entrepreneur can (1) determine how preferred each product attribute is, (2) in consequence, how preferred a potential new product will be, and (3) what is the likely market share that will result from introducing a new product. What's the advantage over entrepreneurs that do not use Conjoint Analysis? A myopic entrepreneur will launch a new product with insufficient information about consumer preferences. This is likely to result in an unsuccessful product introduction. A market-oriented entrepreneur will first determine the ideal product that consumers want, based on solid analysis of their preferences, and then introduce it, minimizing risk of failure. This entrepreneur will come to investor meetings without understanding how much will consumers like his or her product. This can generate suspicion and invite slotting allowance charges, which both diminish the entrepreneur's potential of securing investor funds. This entrepreneur will back up his claims with real data on consumers' preference for an ideal new product. Also, the entrepreneur will be able to predict the market share resulting from the new product introduction. This is likely to give investors' more confidence and potentially lower slotting allowances. What do entrepreneurs need to determine consumers' ideal product? A survey that records consumers' ratings for product profiles - that is, for different types of products, where different means has different attributes. These ratings can be on a scale of 1 to 7, 1 to 9, or 1 to 10. For example, one could determine 12 different product profiles, and ask consumers to rate each of those profiles from 1 to 10. Software packages, namely Microsoft Excel. How can entrepreneurs determine consumers' ideal product? To begin our discussion, it is useful to think of products as a "bundle of attributes". Everything you buy as a consumer, and market as an entrepreneur, can be understood in this way. You may never look at a box of Frosted Flakes in the same way again! Figure 1: What's in a box of Frosted Flakes? Three main attributes that consumers think about when buying a product, service or idea. Each attribute, in turn, has levels, that is, the various different expressions of the attributes a product contains. 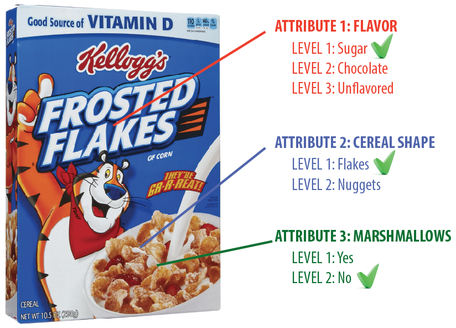 In the case of Frosted Flakes, the attribute levels that compose them are sugary flavor, flake shape, and presence of marshmallows. This is known as the product profile of Frosted Flakes. Our assumption, when thinking about products as bundles of attributes, is that every product possesses one level of each attribute. Therefore, any product in the market could be summarized using a combination of these attributes - a profile. Now, if we believe that flavor, shape, and marshmallows are the main three attributes in the market for cereals, how many products could we potentially design? By multiplying the number of levels in each attribute, it can be seen that the number of potential product profiles is 3x2x2 = 12. First, what consumers state may not necessarily reflect what they truly prefer. This is a big issue when developing controversial or sensitive products, or products that the consumer wants to use to signal a certain status they may not want to admit. Thus, ideally, you should use a method that allows you to recover consumers' preferences from their actual, observed choices. These are called revealed preferences. Second, even if consumers were willing to truthfully reveal their preferences, sometimes these are hard to articulate. For example, you may be able to articulate how much you prefer one car, or one house, from another, and do so attribute by attribute, because these are high-involvement products. But how about toothpaste? Detergent? Toilet paper? In situations where the product you want to introduce is a low-involvement product, obtaining accurate preference estimates is an issue regardless of how truthful consumers are. The need for obtaining revealed preferences, and the difficulty of articulating them, calls for a statistical method that allows you to recover these revealed preferences in a simple way. When you are thinking about developing a new product, and you want the above, Conjoint Analysis is the way to go! The first step in the Conjoint Analysis study is to determine what attributes, exactly, do consumers consider when purchasing within the product category of interest. For example, when thinking about purchasing a new laptop computer, do consumers think about their speed? Display quality? Size? Weight? Hard drive size? These attributes are generally uncovered through a series of focus groups. Furthermore, the relevant levels within each attribute must be determined as well. For example, how many laptop computer sizes do consumers generally consider? Note that, unlike a perceptual map study, here we are not as interested in the mind map itself. The crux is to obtain consumers' preferences for product attributes. Some attributes may not be objective, but rather subjective. For example, a 2008 study by Luo, Kannan and Ratchford show how consumers perceive a power drill along a series of objective attributes (such as shape, switch type, and weight) as well as two subjective attributes (perceived power and comfort). Their research shows that incorporating these subjective attributes into product profiles may allow us to obtain more information on what the ideal product for consumers is. After determining the relevant product attributes, and their corresponding levels, a set of product profiles must be developed, and then coded into an SPSS file, Excel spreadsheet, and so forth. You can see an example of product profiles in a conjoint survey here. The objective is to develop profiles that consumers will then rate according to their preference. The idea is that by knowing how much they like a particular product profile, you can infer how much they like each separate attribute level. Recall that the number of levels for each attribute must be multiplied. Consequently, when the number of attributes and/or levels is very large, you may not be able to show all potential profiles to consumers. In that case, only a smaller set of profiles may be shown. Designing these is outside of the scope of the course, but interested students may wish to read on fractional factorial experimental designs. These profiles are developed with a technique called "dummy coding". With dummy coding, we create a file with a number of columns equal to the number of levels in our study. Each row represents a product profile, and each column represents a particular attribute level. In each cell, the number "1" denotes that a particular profile has that attribute level, and the number "0" denotes the absence of that level. Table 1: Three cereal profiles: Can you describe them? For example, in Table 1, Profile 1 represents Frosted Flakes (i.e. a sugary cereal, with flake shape, and no marshmallows); Profile 2 represents a version of Frosted Flakes with nuggets instead of flakes; Profile 3 is a new cereal that has chocolate flakes and marshmallows. IMPORTANT: Remember that products can have NO MORE THAN ONE LEVEL per attribute! In other words, a product can't both have and not have marshmallows at the same time! No Marshmallows was removed from the marshmallows attribute. The reason why we remove these will become clear in the next section. For more information on coding, download my notes on data coding from my Analytical Methods page. Finally, notice that there is a new column, called RATING, which is left blank. For each consumer you survey, you will create a spreadsheet like this, and copy their ratings for each profile there. Brand: Complete, Smile, and Wave. Scent: Fresh, Lemon, and Unscented. How many potential product profiles could be produced in this context? Figure 3: Our Excel/SPSS sheet for the detergent Conjoint Study. Notice how all ratings in this case are between 1 and 10. Can you describe each product profile by looking only at the table? You can run Regression Analysis in Excel by installing the Data Analysis toolpak (this works only for PC). In SPSS, you only need to go to Analyze -> Regression -> Linear. Figure 4: Regression Analysis results for Detergent study. Data is for a single consumer, in Figure 3. What are the attribute LEVELS the consumer prefers more? - The first column just shows the names of each level. An additional level, called Intercept, is added. The Intercept represents consumers' "base" preference for all detergent products. Different levels of detergent attributes will make this base go up or down. - The second column, Coefficients, displays the consumer's preference for each level. - The last column, p-Value, holds a value between 0 and 1. Only levels whose p-value is smaller than or equal to 0.05 truly make a difference for the consumer. Figure 5: Interpretation of consumer preferences. For each level, interpret in relation to the benchmark you defined when you constructed the dummy set. Faces taken from the Wong-Baker FACES scale (http://www.wongbakerfaces.org). Which is the worst brand? Which is the most preferred price level? As you can see, preferences are interpreted with respect to the benchmark, valued at zero, regardless of which benchmark you defined! So, in this case, Wave is the most preferred brand. Because we set it as benchmark, brands worse than Wave have negative preferences, and brands better than Wave would have positive preferences. In addition, it is important to note that the distance between each level matters. For example, there is a huge difference between Wave and other brands in this consumer's mind. However, there is not so much difference between the Fresh, Lemon, and Unscented scents. These distances reflect how strong the preferences are. What are the MOST IMPORTANT ATTRIBUTES overall? This idea of distance has a powerful implication. As you noticed from Figure 5, the distances between the brand levels are very large, but others, such as the scent levels, are not. When consumers have stronger preferences for certain attributes, in general, the distances within its levels will be larger. With this idea in mind, we can calculate the importance of each attribute, regardless of its levels. Find out what is the least preferred attribute level for the attribute. Find out what is the most preferred attribute level for the attribute. Subtract the maximum minus the minimum. These importances represent how much the consumer prefers whole attributes, in big "chunks". So, once you have computed each importance, sum all of them. This would give you a number that represents, overall, how happy this consumer would be with the product. Finally, divide each importance by the sum. That would tell you the portion of consumers' happiness that each attribute, as a whole, conveys. Figure 6 explains this idea - warning, though: in Figure 6, the softener attribute was removed because of its small importance! This is why softener is not included. Figure 6: Calculating each attribute's importance - think of total importance as a tape that measures how happy the product makes the consumer. Each attribute occupies a different part of the tape. A larger part implies consumer cares more about that attribute! With this information in hand, you now know that, for this consumer, brand is most important, followed by weight and price, and finally scent. Softener is negligible. Furthermore, using your p-Values, you can also determine that only the brands, as well as the 48 oz. weight and the $2.99 price point really make a difference for this particular consumer. That not every level may make a difference for the consumer - specifically, those levels with a p-Value <.05. That we can calculate how important for each consumer each attribute is, regardless of its levels, by using level preferences. What's missing? The best part - let's design consumers' ideal product! Recall that you now know this particular consumer's preferences for every attribute level. In addition, you know the value of the "Intercept" - a baseline preference that drops or rises, depending on which attribute levels a certain product has. Table 3: Five candidates for this consumer’s love: Which will come out on top? How would a myopic marketer, who **did not** conduct Conjoint Analysis, would go about finding consumers' ideal product? How will **you** do it using preference information? 2. Next, add the brand preference (Complete): 6.12 + (-6.05) = 0.07. Be very careful!! : when we added the price preference $4.99 was defined as our "benchmark" level for the Price attribute. Therefore, its preference is set at 0, as we saw in Figure 5 when we interpreted preferences. Table 4: With preferences in hand, product candidate 2 wins! If you had to choose from the above four designs to satisfy this consumer, the obvious choice is to design and launch product candidate 2 as your new product. As you can see, this is much, much better than trying to blindly design a new product or deciding based on a couple of focus groups. Table 5: For this consumer, a couple products are terrible; most are mediocre; less than 10 guarantee success. As you can see, among the more than 100 potential product designs, less than 10% of them would be most preferred by this person. This is why using Conjoint Analysis to find consumers' ideal product is so helpful. What do you think is the best design? As it turns out the best design is a Wave detergent, unscented, with no softener, weighing 48 oz., at a price of $2.99. This product has a preference score of 8.68. What if I want to learn about preferences for MORE than one consumer? Conduct Regression Analysis on each of the 50 consumers’ profile ratings separately. This will give you 50 tables as the one shown in Figure 4 (you can ignore the Intercept). Table 6: Average preferences for every attribute level on a 5-subject sample. Table 7: Average importance for detergent attributes on a 5-subject sample. Do the 5-subject sample importances look like the ones calculated for our first subject? As can be seen, a reasonably sized sample would be ideal for investigating consumers’ ideal products. Make sure you conduct the Conjoint Analysis study with at least 30 subjects. How do we predict market share for the product we choose to launch? To predict market shares, you must first determine the following. Among the product designs you can evaluate based on consumer preferences, which are most likely to be on the shelves alongside your newly launched product? This constitutes the set of products consumers will compare to decide what to buy - this is known as consumers’ consideration set. Next, calculate how preferred each product in the consideration set would be, according to those preferences. The product with the maximum preference among all products in the consideration set is the one you would expect the consumer to choose. This is known as the maximum utility rule: whatever is predicted to be most preferred is assumed would be chosen by that subject. Other rules, such as the logit rule, exist. Once you determine what consumers’ would have most likely chosen, you can simply compute the percentage of predicted choices for each product. For example, if you survey 20 individuals, whose consideration set consists of 6 products, and 7 individuals choose Design 1, then Design 1 would obtain a market share of 7/20 = 35%. That’s it! You can practice using our class dataset here. Consumer Reports. 2014. The downside of too many product choices on store shelves. Consumer Reports, January 2014. Accessed February 18, 2014 (Source). Luo, Lan, Brian T. Ratchford, P.K. Kannan. 2009. Incorporating Subjective Characteristics in Product Design and Evaluations. Journal of Marketing Research 45(2), pp. 182–194. Wind, Jerry, Paul E. Green, Douglas Shifflet and Marsha Scarbrough. Courtyard by Marriott: Designing a Hotel Facility With Consumer-Based Marketing Models. Interfaces 19(1), pp. 25–47.